I’m as guilty as anyone for undervaluing both my own work and that of others. I tend to overlook the time it takes to do something, to create something, to produce something – and in doing so I’m invariably surprised at the price of said somethings. Take some Hungarian cross-stitched embroidery. Beautiful stuff. Hours and hours go into making just one table piece. The patience required is incredible and for me, given my notable lack of same, barely imaginable. And yet, although I know it takes hours of work, I don’t want to pay what the shops are asking and I feel guilty about not paying enough when I buy from source. Somewhere, there’s a mismatch. 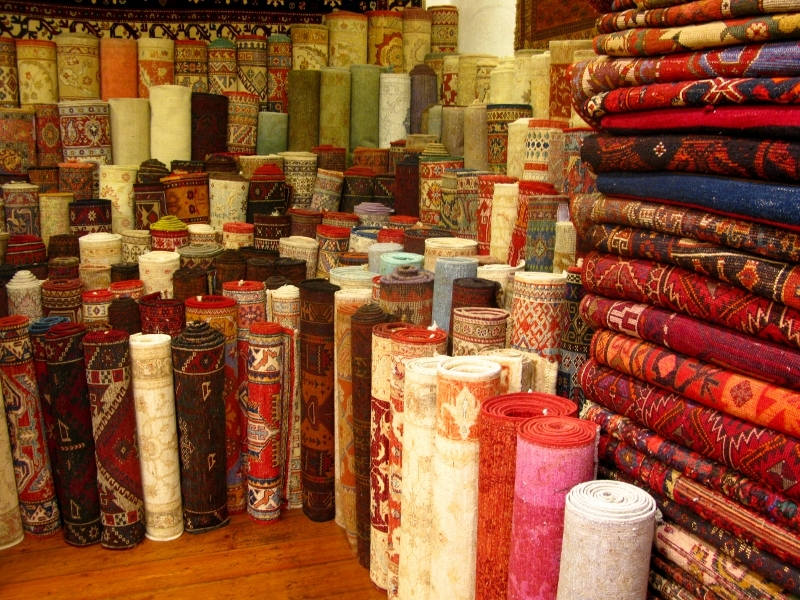 In Istanbul, I had the (good/mis)fortune to visit a couple of carpet shops. I was given the whole spiel on how they’re made and where each type is from. The price tags were quite incredible. We’re talking thousands of dollars here for pure silk and a thousand plus for artificial silk and cotton. The smallest one I saw had an asking price in the hundreds of dollars, and even that was out of my reach. No matter. I’m a chobi fan myself (an expensive hobby to have) and have neither the money nor the floor space to mix my designs. Regardless of the material used though, the same amount of work goes into each carpet. And that’s a lot of knots. 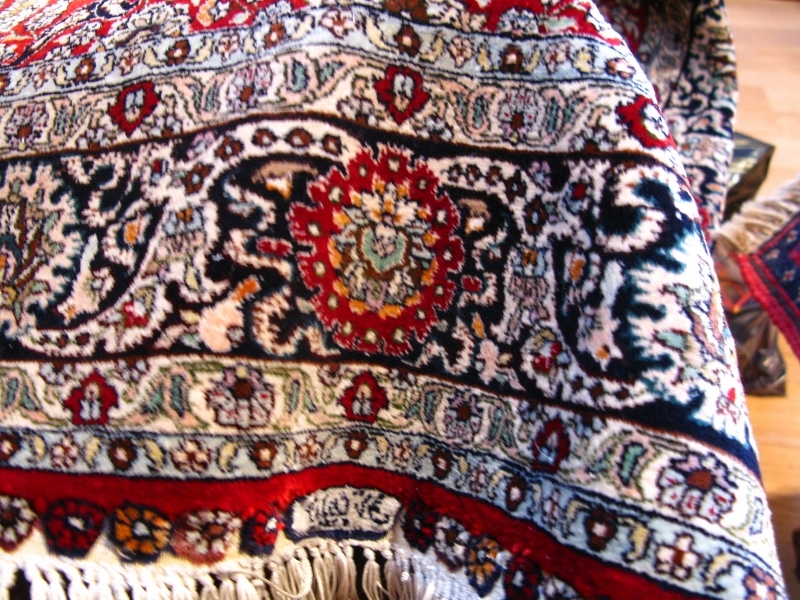 A carpet that is 10×10 (I can’t remember if it was feet or metres) in size requires more than one million hand-tied knots and a hell of a lot of patience. 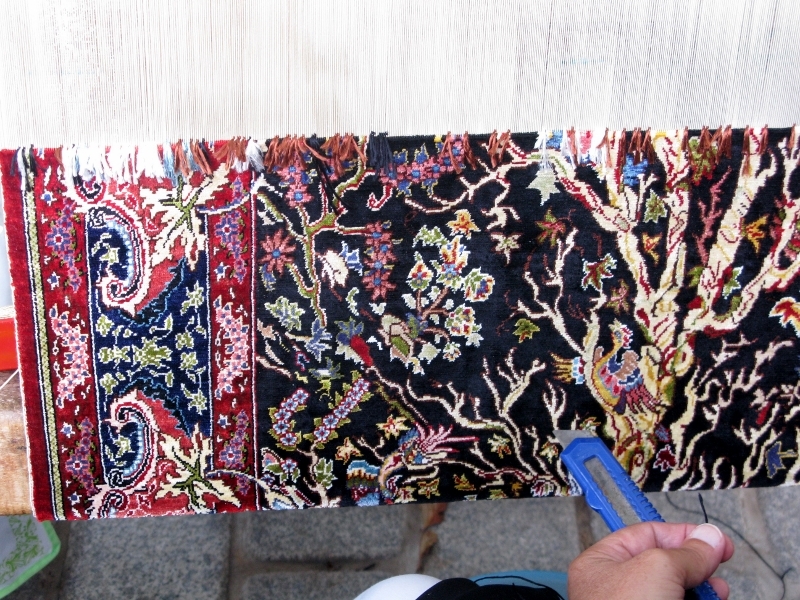 I watched one lady as she worked on a silk carpet and I was gobsmacked. 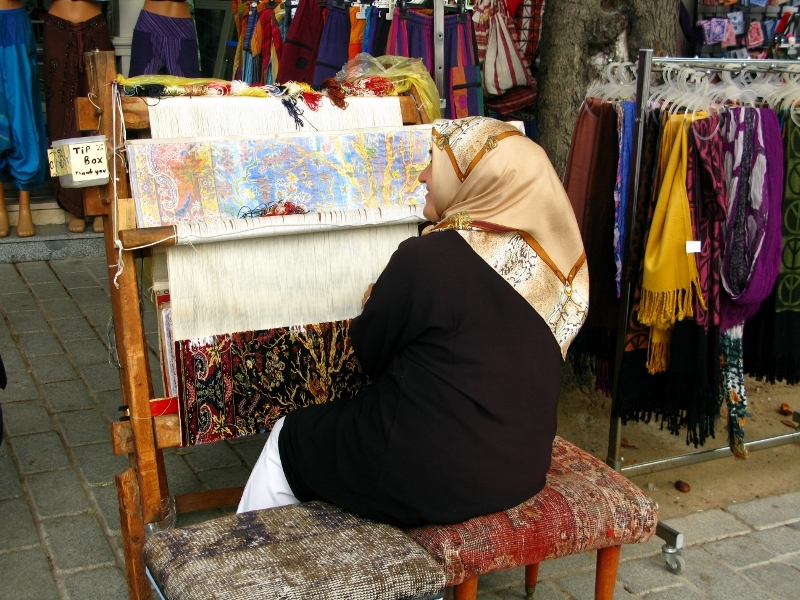 Yes, it was a tourist promotion thingey – she was outside a carpet shop down by the Blue Mosque. What struck me was how incredibly good-natured she was. I can imagine the sort of foul mood I’d be in if I had to pay my bills by sitting at a loom all day tying knots only to have some tourist like me ooh and aah and then cringe at the price. Her tip box wasn’t exactly weighed down with millions of lira and I couldn’t quite figure out the math. Apparently the carpet she was working on would take six months to finish (she is paid 1500 a month – about $660). It would sell for $4000 and so cost far more to make. I thought I might have lost something in translation but the salary seems right, as an intern at Microsoft makes on average $1200 per month. And with all due respect to said intern, this lady may well have more talent in her little finger. The carpet was exquisite. Perhaps she’s paid more as a performer and some little old dear in a Turkish village gets just a fraction of that. Who knows. I often wonder how much money buskers make, or mime artists, or others who spend their day showcasing their talent in front of an often ungrateful public. For me, if I like the music or, better still, like the attitude with which the musicians play – it’s worth a bob or three. I’ve been lifted out of a melancholic haze when walking by a chap playing the sax. I’ve done double-takes when I pass that lad down by Déak tér who looks as if he’s sitting on air. And while I’m no great fan of table-hopping musicians as I eat, I’m all for musicians on public transport. I just wish that the general public would pay more attention, be a little less distracted, and acknowledge the creative talent of those for whom the street is their stage. Note to self already made. 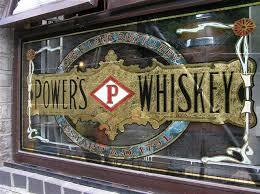 What makes an Irish pub Irish? I’m fussy about my pubs. I’m even fussier about foreign pubs that claim to be Irish. They need to be Irish owned with at least one genuine, dyed-in-the-wool Irish person behind the bar or working the floor. Someone who knows how to banter, to give the nod. Otherwise, in my humble opinion, they have no claim to being an Irish pub. I’ve banged on about this for years and rightly or wrongly, that was my belief and I was glued to it. suspects – Joyce, Behan, Beckett, Wilde et al., all come neatly crated ready to be unpacked and hung on the walls. The Juke Box comes loaded with the Waterboys, U2, The Cranberries (am I dating myself?) 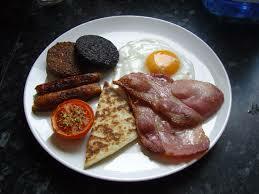 or whomever has carved a niche as being Irish on the international music circuit. Depending on the politics of the location, you might get a rabble of rebel songs from the Wolfe Tones and the Chieftains. Or a few Daniel O’Donnell albums for the crooners. But these are just the trappings. Looking like an Irish pub doesn’t make it an Irish pub. Having sawdust on the floor isn’t enough to turn your hostelry into the like of what you might find in the west of Ireland. And playing a few jigs and reels should never be mistaken for atmosphere. When I’m abroad, I avoid Irish pubs with the same enthusiasm that I avoid bacon and cabbage, unless there’s a match I want to see… then I go out of my way to find one. I tell myself that I didn’t come to Istanbul or Athens or Rome or wherever to sit in an Irish bar and drink imported beer. 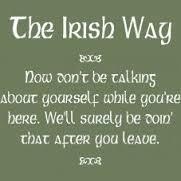 Like any self-respecting Irish tourist, I know my boundaries. So when I was wandering around Taksim on my first night in Istanbul in search for a reasonably priced glass of white wine, the last place I thought to look was the local Irish pub – The Dubliner. I did stand across the road though and take a photo for posterity. I struggled with my conscience and the consequences that crossing the street might have for my reputation. And the lads, seeing my hesitancy, did what any Irish publican would do – they gave me the nod. I walked over and checked the menu to see what they were charging for a pint of blackened Liffey Water. We sparred a little, going back and forth about how sacrilegious it would be for me to go inside and sit down, me being Irish and in Istanbul to see something new, something different. But they had it nailed. They had the banter and the smiles and the ‘we-couldn’t-care-less-what-you-do-but-sure-why-not-have-a-quick-one-while-you-make-up-your-mind’ attitude that is hard to fake. And in I went. For one. The following night, I was joined by a colleague from Romania. We had dinner and then I heard myself suggest that we go to this Irish pub I’d come across the night before that played music from an Ireland I’d thought had died years ago. As we approached, the lads recognised me, bade us welcome, set up the white wine, broke out the apples and the nuts, and kept an eye on us all evening. We were joined later by a third colleague from the Czech Republic. And each of us received the same attention. They said the owner was Irish, from Cork. So I felt vindicated. I met him (a lovely man) and it turned out that he was local but had lived and studied in Cork for so long that he himself felt he’d made the transition. And I felt a little cheated but two nights in a row meant that I’d gone beyond redemption, lineage be damned. On the third evening, we went back again, all three of us plus a couple of Serbian colleagues and so the pattern continued. I had such a good time that I got over the fact that it wasn’t meeting my strict criteria of being Irish owned and Irish staffed. We didn’t go every night but we dropped in for one if we were in the neighborhood. And each time, we got the nod – that acknowledgement that we weren’t simply customers, currency on legs. And this is what makes a pub Irish: the nod. It’s not rocket science – and yet so few pubs manage it. Treat your customers as if they’re more than customers and they’ll come back. Take the time to chat. Pay attention to the amount of attention they seem to want and if they’re up for some banter, then engage. If they’re not, keep a watchful eye from a distance and keep them fuelled. Know enough about what’s going on in the world to be able to find something to talk about. Remember what they talk about – because if you show interest, they’ll come back. And if they feel they were given their due, without being fawned over, then they’ll come back with friends. I’ve officially changed my mind. My long-held belief that to be really Irish, an Irish pub has to be Irish owned and staffed by real Irish people has wavered. While still the rule rather than the exception (as is the case in Budapest), there are places, like The Dubliner in Istanbul, that have managed to make it happen, and happen in style. One day, when I’m president of Ireland, I’ll make Hadi and Mehmet ambassadors for Ireland 🙂 In the meantime lads, le mile buíochas for looking after us so well. https://unpackingmybottomdrawer.com/wp-content/uploads/2017/06/logo-300x82.png 0 0 Mary Murphy https://unpackingmybottomdrawer.com/wp-content/uploads/2017/06/logo-300x82.png Mary Murphy2014-09-23 10:19:322016-08-10 11:39:25What makes an Irish pub Irish? 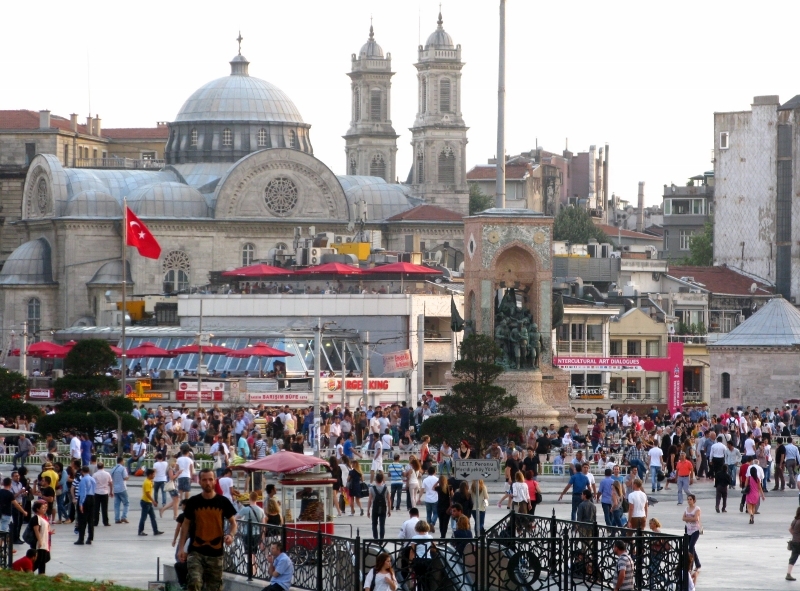 Not that long ago, the hive of activity that is Taksim Square in the European part of Istanbul was in the news all over the world… and not for the first time. Back in 1969, in February some three years before Ireland saw its last Bloody Sunday, about 150 demonstrators were injured in clashes with right wing groups on a day that is also remembered as Bloody Sunday. In May of 1977, in what is known as the Taksim Square massacre, 36 demonstrators were killed by gunmen on the square on Labour Day. Fast forward to 2000 when two Leeds United fans were stabbed to death on the even of the Leeds vs Galatasaray (UEFA Cup semi-final). In October 2010, a Kurdish suicide bomber injured 15 police and 17 civilians in the process of taking his own life. Most recently, in June 2013, protestors trying to save the park from government developers keen to turn it into a car park and expand the shopping area, also met some heavy-handed treatment with three demonstrators and one police officer losing their lives. There is little about the square to mark these events. It’s throbbing with activity day and night – with kids and adults alike just hanging out, chatting, enjoying the evening sun. Like spokes on a wheel, the streets that converge on the square are lined with shops offering everything from designer gear (is it real?) to Turkish tat. And off the main arteries, the side streets are a maze of bars, restaurants, and cafés. I felt a little like Alice in Wonderland when she went down the rabbit hole – I had no clue what to expect and was soon caught up in the melee. On a Friday night about 7.30, the place was like Grafton Street on Christmas Eve, with tides of people moving in either direction. Moving back and forth was fine – but crossing the street required sharp elbows and bare-faced determination. Here in Budapest, there’s a pharmacy on every corner – or so it seems. 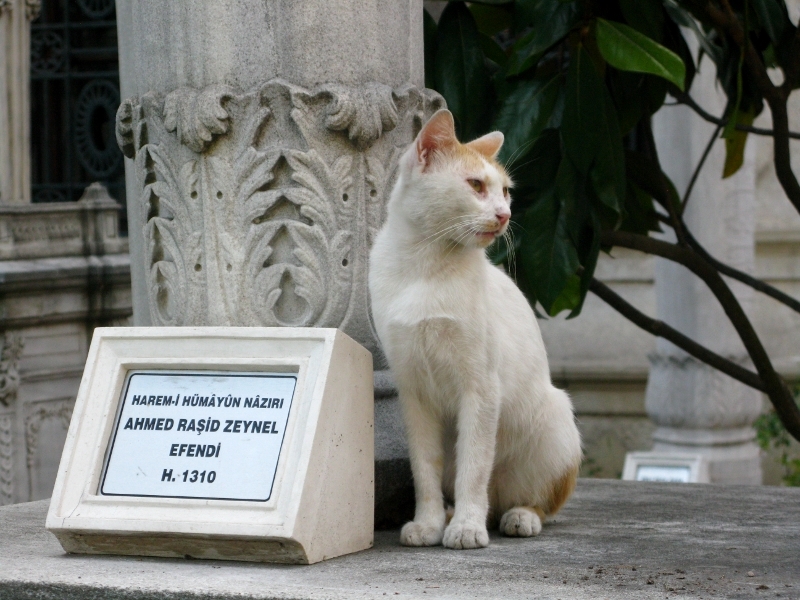 When I went in search of one in Istanbul, I had to really look. I wonder what that says about the nation’s state of health? Is there a correlation? 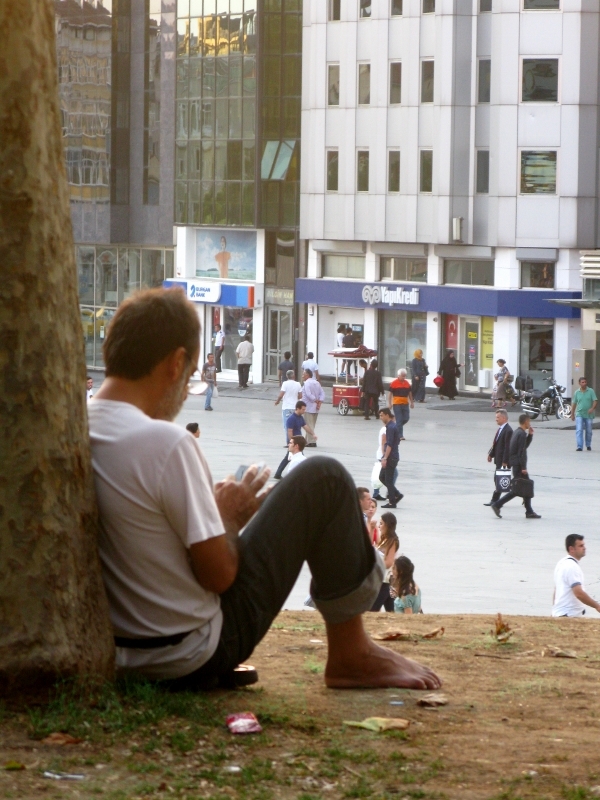 If you’re into people watching, Taksim is the place to be. Every shape, colour, size is on view. Watching the tourists flail around like headless chickens (no doubt someone somewhere was watching me do likewise) was amusing. Those who’d already been in the city a few days knew enough not to take out their map. Maps are like magnets for the helpful agenda-ists – best to soldier on and pretend you know where you’re going. And if you pass the same people hanging on a corner three times in a row, just offer up their knowing grins to the tourist god. 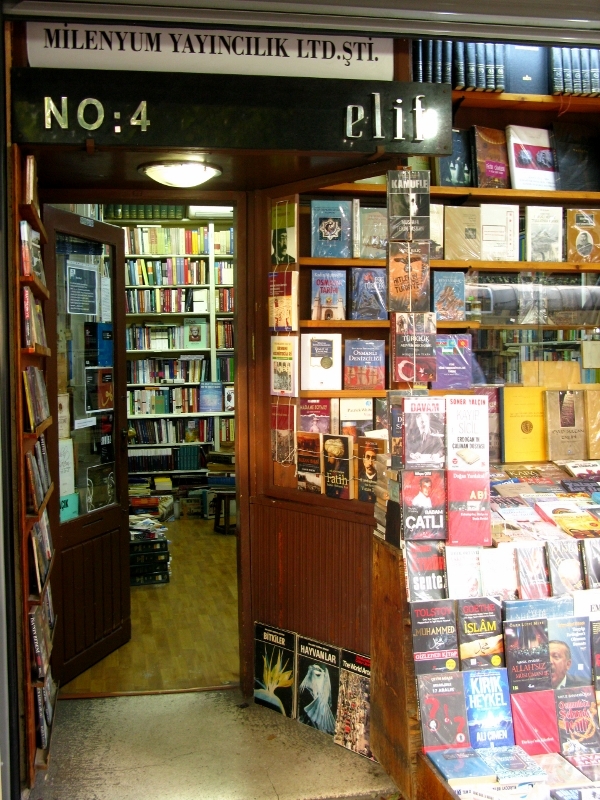 It was here that I found a bookshop with English-language translations of local writers. It’s a habit I’ve gotten into over the years whenever I travel – looking for translations of local authors who are not widely published. I am currently engrossed in Buket Uzuner’s Two Green Otters: Mothers, Fathers, Lovers, and all the Others. It’s a fantastic read – so good, in fact, that the typos are just niggling rather than annoying. And that’s high praise indeed. While I was there, I read Olen Steinhauer’s The Istanbul Variations, an impressive account of the Cold War set in the city in 1975. And for later, when I come down off this post-Turkey high, I’ve another of Uzuner’s waiting in the wings. Istanbul – you were quite an experience. Nearly two weeks on, I’ve made my peace with you and, if you’ll have me, I’ll happily return. I’ve never been more aware of the fact that I am partial to a glass of wine or two than when I was in Istanbul. Unlike Budapest or Dublin or other places I’ve lived, it’s not a given that every restaurant will serve alcohol. And having to ask before I sat down, while not quite making me feel awkward, certainly drove home the fact that for me, dining and wining are almost intricately interlinked. That’s not to say that I have wine with every meal or drink every time I’m out – I don’t. But I am quite partial to a glass of vino. 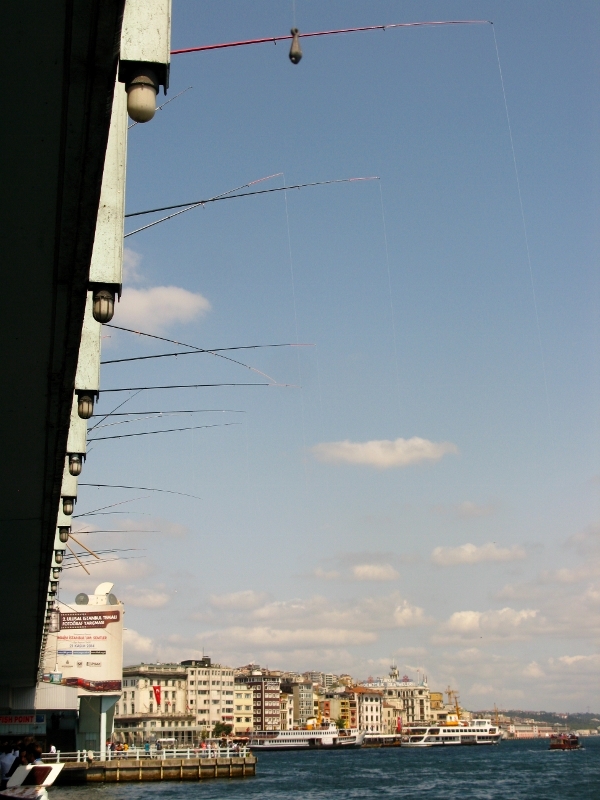 Walking underneath Galata Bridge was high on my list of things to do while I was in the city – it was a short list as I’d done very little to prepare myself other than to email a friend who had lived there and ask for advice on what not to miss. The view at night from the bridge is stunning. 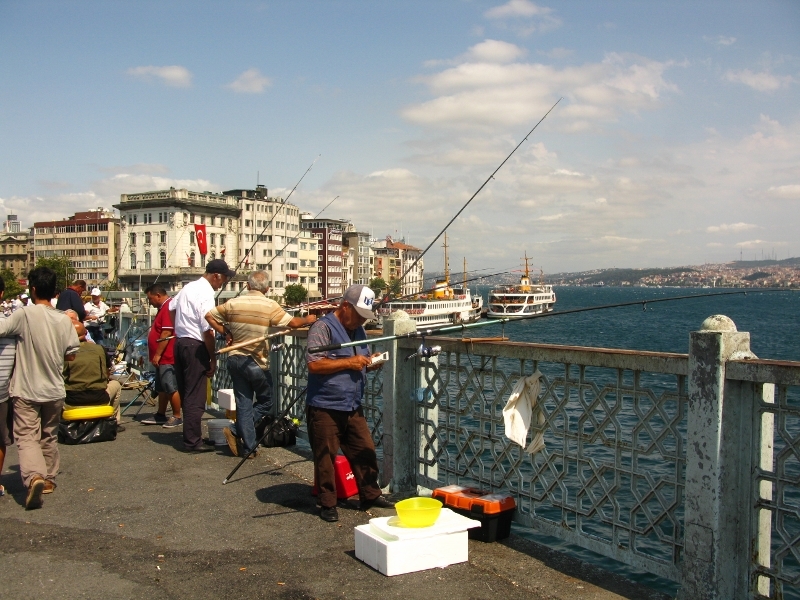 With construction on this edition ending in 1994 (the first version of this bridge having opened in 1845), it’s close to 500 metres in length, spans the Golden Horn, and has featured in tales of the city since the nineteenth century. Underneath, rows of fish restaurants and cafés compete for business as if their lives depend on it (and perhaps they do). Touts lure tourists in with all sorts of banter, not too dissimilar to what you’d get on the markets in London’s East End, except with an accent and the inevitable first question: Where are you from? There’s not much to choose from menu-wise and the prices are pretty standard so you’re left (as I was) to count how many locals are eating where and going for that one. Up above, lines of fishermen fish for mackerel (or at least I think that’s what was coming out of the water, but I wouldn’t swear to it). Be it fact or fancy, it definitely gives the illusion that everything served in the restaurants below hasn’t been too long out of the water. Reviewers on Trip Advisor seem to have missed the point of it all. They warn to stay away, using loaded terms like tourist trap, cons, rip-offs, etc. 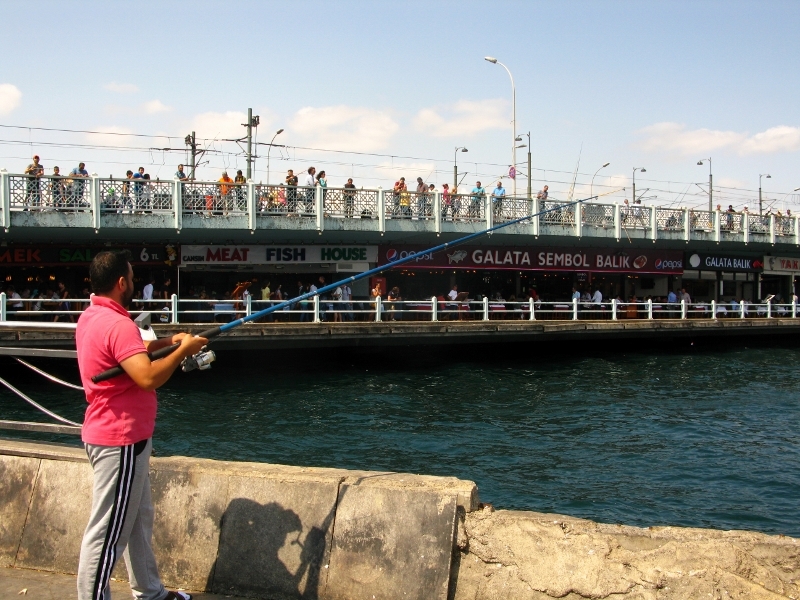 Of course it’s a tourist trap – and yes, you can eat for less elsewhere in the city, but if you’re eating elsewhere, you’re not eating under Galata Bridge. The mind boggles. As for the bantering … that’s all part and parcel of the experience. Just indulge them and enjoy. I challenge you to find better entertainment for the same price anywhere else in the city. From the bridge there are great views of the Yeni Cami (New Mosque) which was finished in the 1600s. This gives some indication of Istanbul timescales. Way back in 1591, the residents (mainly Jewish) were relocated to make way for the mosque. (Resettling is not a recent thing, then.) I was reminded of an Irish priest friend of mine who lives in Brussels. He was moaning one day about the notion that because he’s a priest, everyone feels he’s fascinated by churches and so visits to new cities end up as an ABC tour – another bloody church. I’d been in the Blue Mosque already and was suitably impressed so when I went inside the Yeni Cami, I was expecting something different. But to the naked untrained eye, it’s pretty much the same, albeit it on a slightly smaller scale. The tiled ceilings are impressive as are the carpets. The vast expanse of pew-less space takes a little getting used to for a Catholic girl used to seeing the congregation in straight rows alternately sitting, kneeling. and standing. 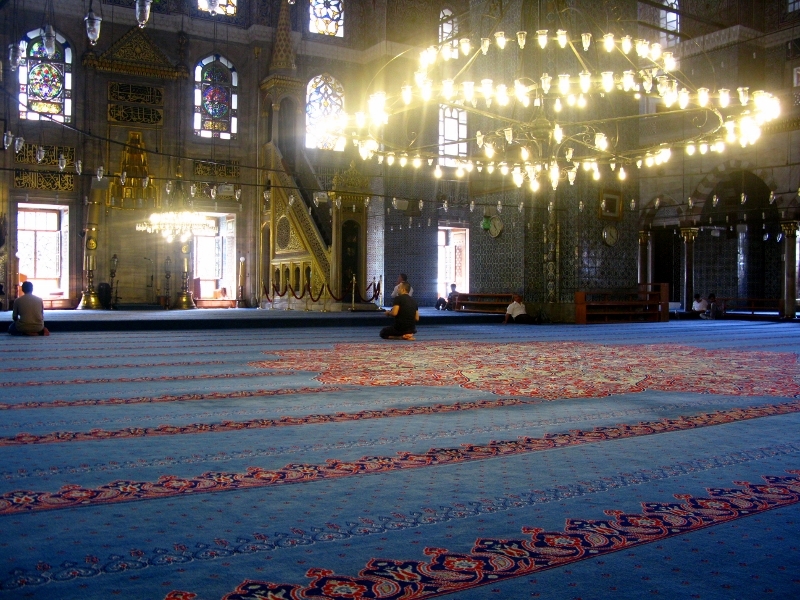 Rightly or wrongly, the urge to see any more mosques left me. Churches vary according to religion and style – some are more ornate than others, some are simple to the point of paucity. But each has its own character. Am open to correction; if there are mosques that differ, please tell me. Islam is a religion I’d like to know more about. Its rituals are fascinating. I was particularly taken with the ablutions, where hands up to the wrists are washed three times; the mouth is rinsed three times; the nostrils are cleansed three times; the whole face is washed three times with both hands, from forehead to chin and ear to ear; both arms up to the elbows are washed three times; the whole head is wiped once with a wet hand; the inner ears are wiped with forefingers, the outer sides with thumbs; and finally both feet are washed three times up to the ankles, beginning with the right foot. 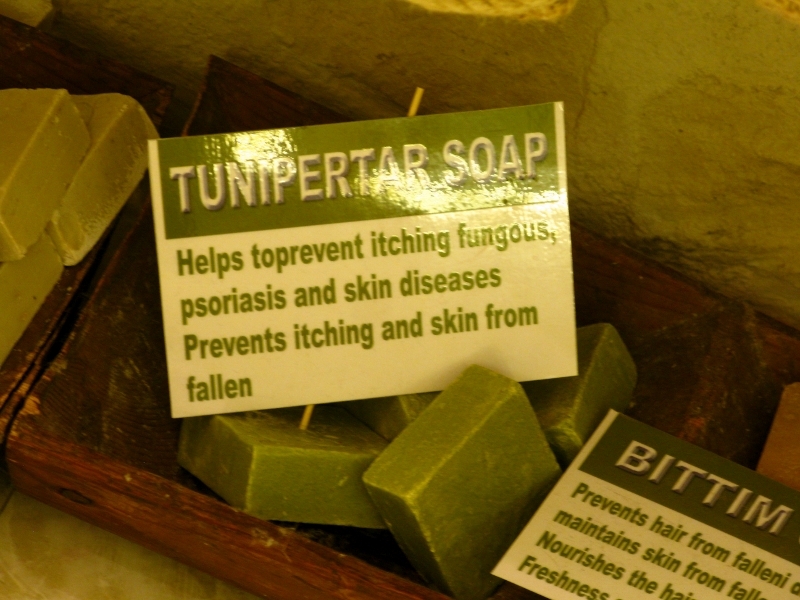 And this is only a partial ablution. As I said, fascinating. There’s a saying in Turkey that a cup of coffee commits you to 40 years of friendship. That’s some commitment. I grew up with instant coffee, granules that you add to boiling water and then add milk (white coffee) or don’t (black coffee). A simple choice – black or white. When I first went to America a couple of lifetimes ago, I was completely bemused by the differentiation between filtered coffee or instant coffee, and completely confused when I went a second time to find that ordering a coffee now took serious thought. The styles: latte, espresso, frappé, cappuccino. The substance: skinny, decaf, leaded. I had my first Turkish coffee in Sarajevo. It’s definitely an acquired taste. I prefer mine with a little milk, which borders on sacrilegious, and is not so much frowned up as simply not understood. Why would anyone want to add milk to Turkish coffee? 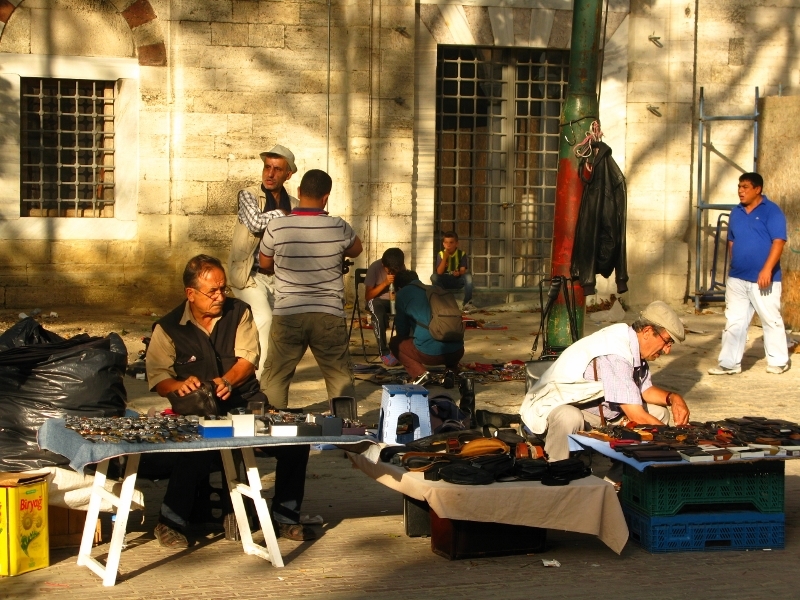 The apologetic, wheedling smile that accompanied my request worked most of the time in Istanbul, but not always. One chap simply refused point blank. Another turned a deaf ear and ignored the milk part. A third explained to me that it just wasn’t done. Fair enough. When in Rome and all that, I thought…but it didn’t stop me asking. Turkish coffee combines special preparation and brewing techniques with a rich communal traditional culture. The freshly roasted beans are ground to a fine powder; then the ground coffee, cold water and sugar are added to a coffee pot and brewed slowly on a stove to produce the desired foam. The beverage is served in small cups, accompanied by a glass of water, and is mainly drunk in coffee-houses where people meet to converse, share news and read books. The tradition itself is a symbol of hospitality, friendship, refinement and entertainment that permeates all walks of life. 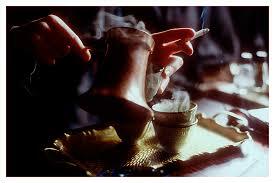 An invitation for coffee among friends provides an opportunity for intimate talk and the sharing of daily concerns. Turkish coffee also plays an important role on social occasions such as engagement ceremonies and holidays; its knowledge and rituals are transmitted informally by family members through observation and participation. The grounds left in the empty cup are often used to tell a person’s fortune. Turkish coffee is regarded as part of Turkish cultural heritage: it is celebrated in literature and songs, and is an indispensable part of ceremonial occasions. Had I known that the grounds left in the empty cup could have been used to tell my fortune, I might be viewing the world in a whole different light today. At the end of a week that had days I thought would never end and days that I thought ended far too soon, I’m in need of a Turkish coffee or three. I’m knackered. So much is going on that it’s hard to keep track of it all. I want to scream at the world to stop, so that I can get off for a while and disappear. But that ain’t going to happen. And while I know that it’s sleep and not stimulants that I need, this week I am grateful for the restorative power of coffee. For the rituals that it comes packaged in. And for the conversation it encourages. To the Sufi monks in Yemen – you have my undying gratitude. I detest shopping for myself. I hate it with a passion that is so unwomanly I occasionally wonder if I was a man in all of my past lives. Perhaps this is my first go ’round as a woman. I hate the faffing and the queues and the decisions involved. I hate the bags and the receipts and the escalators. I hate the fact that sizes differ and mirrors lie. Retail therapy simply doesn’t work for me. Unless it’s civilised. 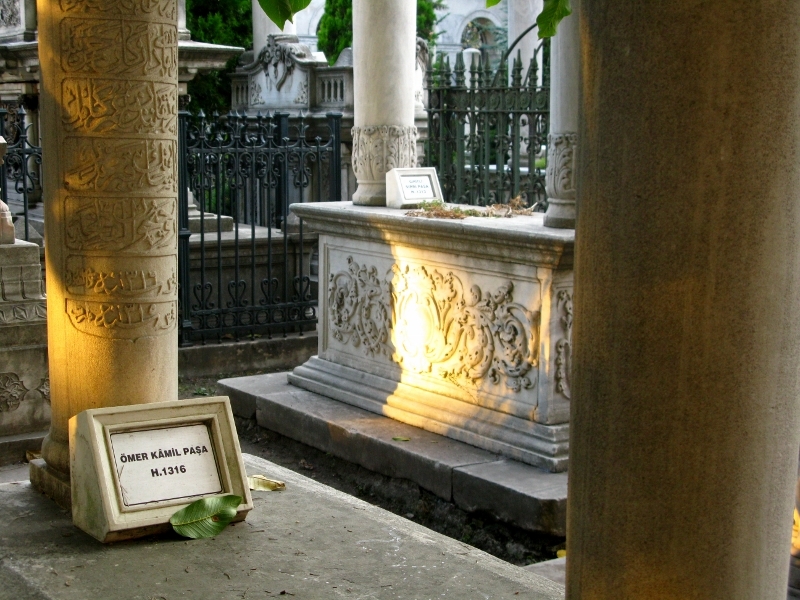 As it is in Istanbul. I was warned about touters who would stop just short of kidnapping me to get me inside their shop. I was warned about the ceremonial teas and the long palavers designed to separate me from my money. I was warned about how relentless they are in their pursuit of customers, of how persuasive they can be, of how genuine they can come across. And despite all the warnings, I was sucked in. And what’s more, I enjoyed it. Immensely. First up was my man Sevket, whose nephew had latched on to me at the Blue Mosque. He took me inside, showed me what to do and gave me a brief history of the place for which I was very appreciative. I literally had 20 minutes before the mosque closed to visitors for prayers so it was handy not to have to waste 15 of those figuring out the rituals. The deal was though, that when we were done, I had to go visit his uncle’s carpet shop. Being a woman of my word, I went. And I made it clear that I had no money. He commented that my sunglasses (which happen to sport the CK label) were worth at least $500. Observant chap. But that was ten years ago, I said, when I had a regular job. That money had long since been spent. I’ll write more on carpets later. Suffice to say that Sevket, like many Turkish men I met, seemed to be looking for a wife. Or so he told me. Now, as a single someone who isn’t at all backward about coming forward when it comes to expressing herself, you’d think I’d be in my element… but no. I was at a complete loss for words. In my defence, I’ve had little experience of proposals. Once we’d established that I had no money, the talk then turned to how I could earn a commission by sending my fellow delegates from the conference to his shop. I had to admire his ingenuity and the tenacity. We parted friends. 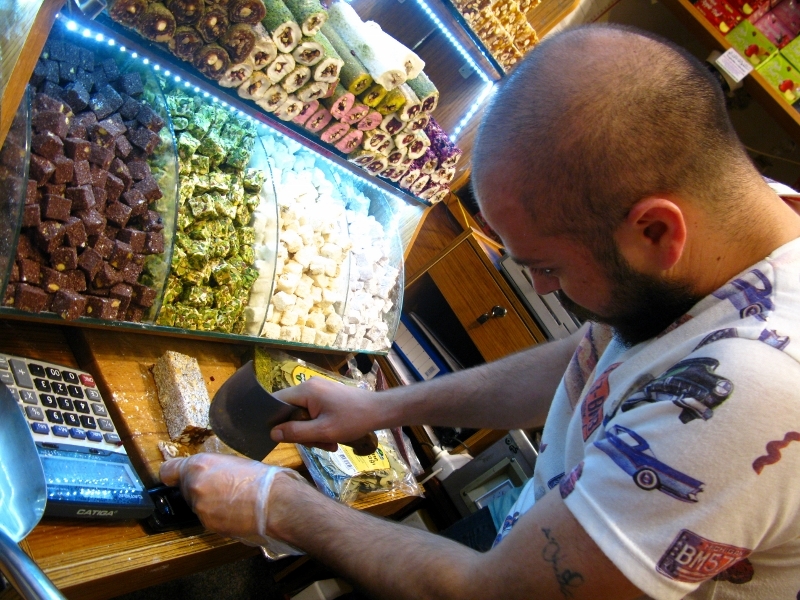 Some days later, at the Spice Bazaar – Mısır Çarşısı- (which, by the way, is streets ahead of the Grand Bazaar when it comes to temperament), we happened into Cihan’s shop (No. 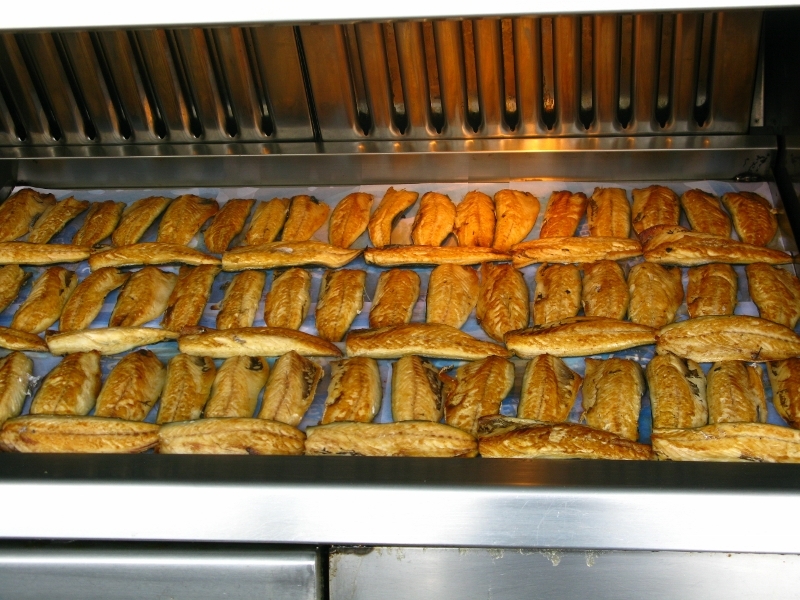 70). Some 55 minutes later, replete with (newly discovered) pomegranate tea, we left, laden with goat hair cloth and silks and soaps. But in addition, we had his story. 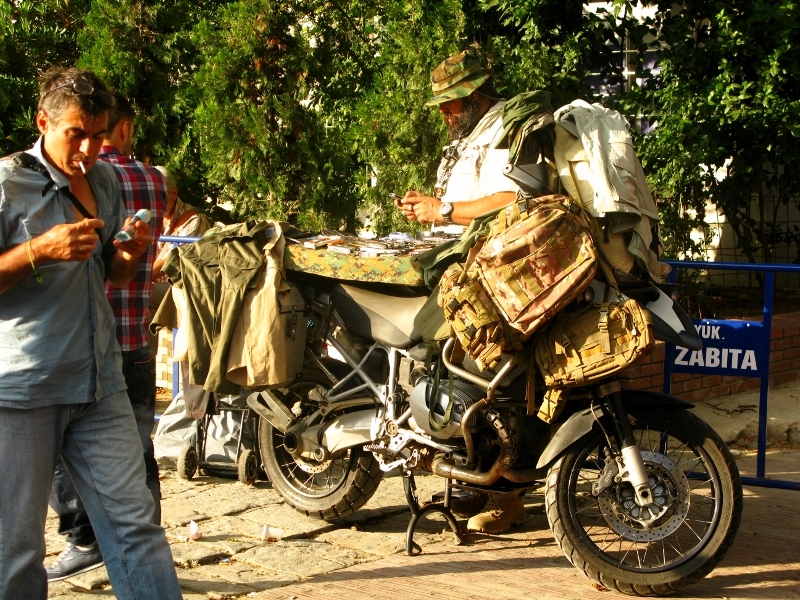 And this is, perhaps, what endears me most to these Turkish salesmen: their willingness to chat about life and its vagaries; to talk about stuff few men are willing to do. If I could be romanced by anything Istanbul had to offer, it wouldn’t be the food, or the mosques, or the history – it would be the people’s ability to chat, to punctuate their conversations with lessons worth remembering. I’m a sucker for deep and meaningful conversation. One of Cihan’s gems, for example, was that you can’t convert people overnight, but rather over time with love and example. He married a Canadian and lives in Istanbul with his wife and daughters and was clear that he didn’t marry her for her passport. Yet they’re planning on moving back to Canada – the government, he says, wants everyone to be religious and have an iPhone. Beautiful. He explained the concepts of helal (that which you deserve) and haram – that which you don’t and spoke eloquently on the diminishing work ethics plaguing the world. It was a joy to listen to him and engage. Next, on Cihan’s referral, we visited Ahmet at No. 76, who insisted on giving us the royal tour of teas, spices, and sweets. 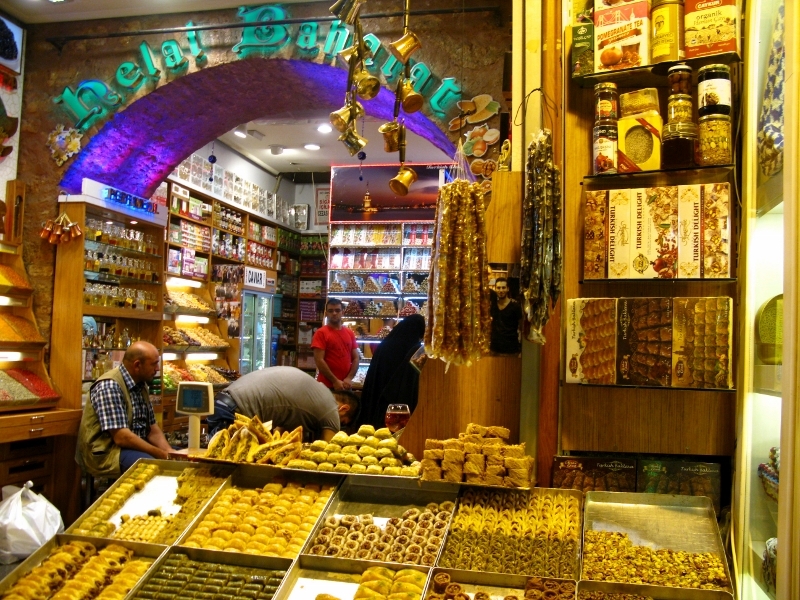 Only once we’d heard the history, and sniffed, smelled, touched and tasted practically everything on display, accompanied by yet another cup of pomegranate tea, would he entertain the thought of us buying anything. And buy we did. He said he understood that we weren’t from Qatar (apparently the embodiment of wealth) and that we should only buy what we wanted and what we liked. When he recommended the anti-aging tea for me, and the love tea for my friend, he managed to do so in a way that made us laugh – and add to our list. He, too, had stories and advice and seemed quite happy to take all the time in the world in dealing with our right, as women, to change our minds … repeatedly. And yet, there remains the constant reminder of why I’d find it hard to live in the city. 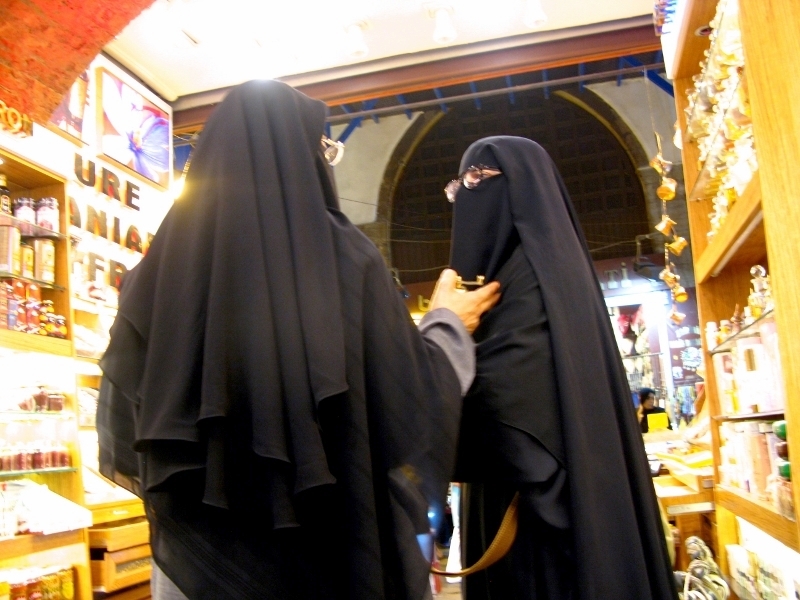 The black-veiled women whom I simply couldn’t figure out. Some walked meekly beside their men – and others, when alone or with another woman, could spout orders and commands with the severity of a Major General. I couldn’t tell those who were Turkish and those whom came from Qatar – as these two did, judging by the size of their bill. 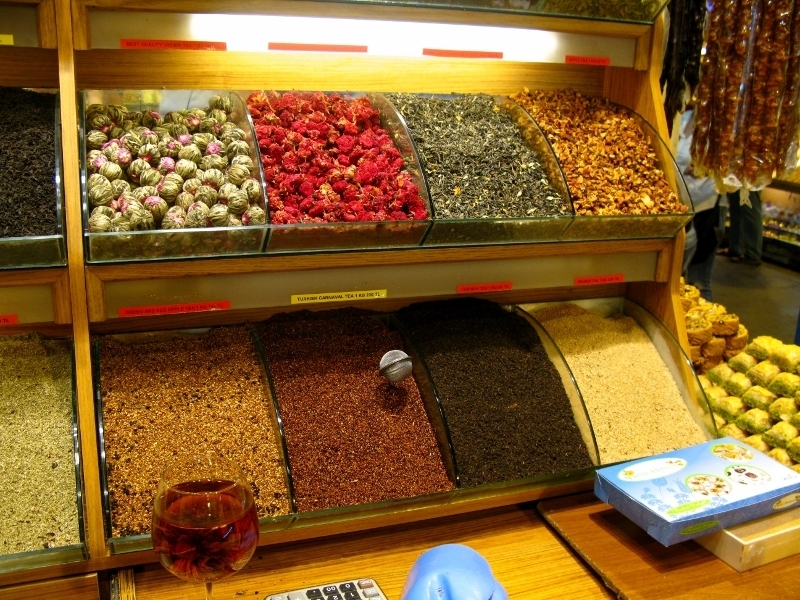 I’ve made a mental note that next time I go to Istanbul, I will find one I can put my questions to… over a cup or three of pomegranate tea. I thought the Golden Horn was a piece of land, not a body of water. I never knew that Istanbul straddled two continents. And I’d never heard that spiders were afraid of ostrich eggs. I learned so much in Turkey this past week. But I still don’t know if the calls to prayer in Istanbul, specifically those from the Blue Mosque and its neighbouring mosques, are live or recorded. They’re remarkably in sync; it seems as if each is answering the other. 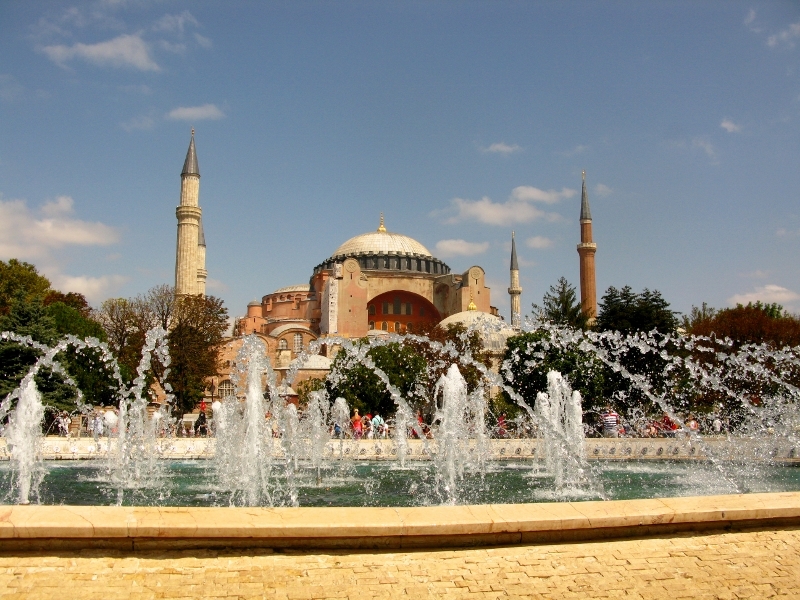 If you could only stop at one place in Istanbul and had no plans to return, the best bang for your buck would be Sultanahmet, home to the Hippodrome and the Blue Mosque and Hagia Sophia. 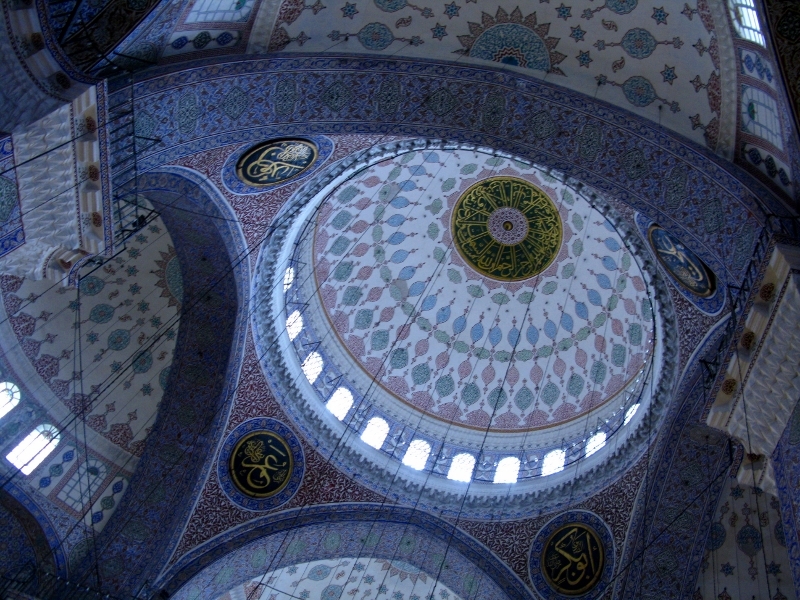 The Blue Mosque is so called because of the 20 000 or so hand-painted blue tiles decorating its interior. They’re stunning. It differs from other mosques in that it has six minarets instead of the usual four, something that came about apparently because of a misunderstanding between the Sultan and the architect. 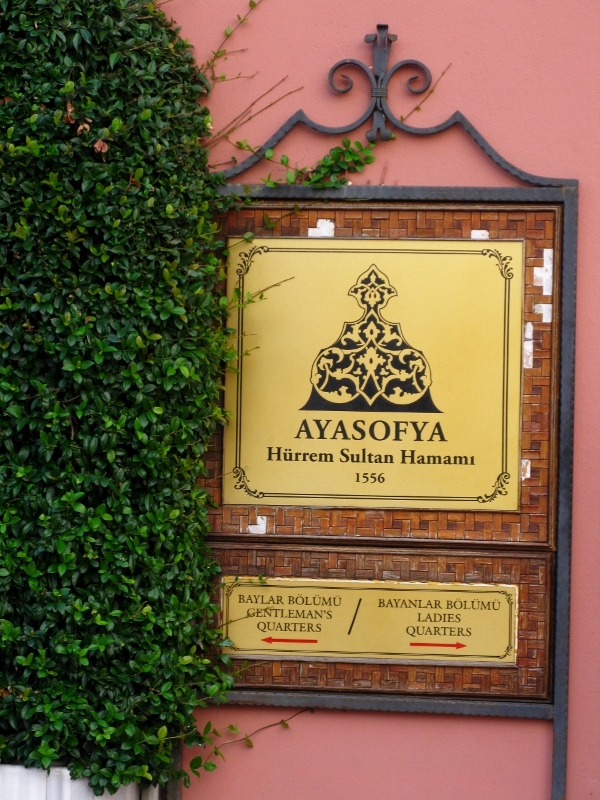 It is said that when Sultan Ahmet I was only 19 years old, he commissioned the construction of the mosque. Sultan Ahmet I requested for gold (altin) minarets. 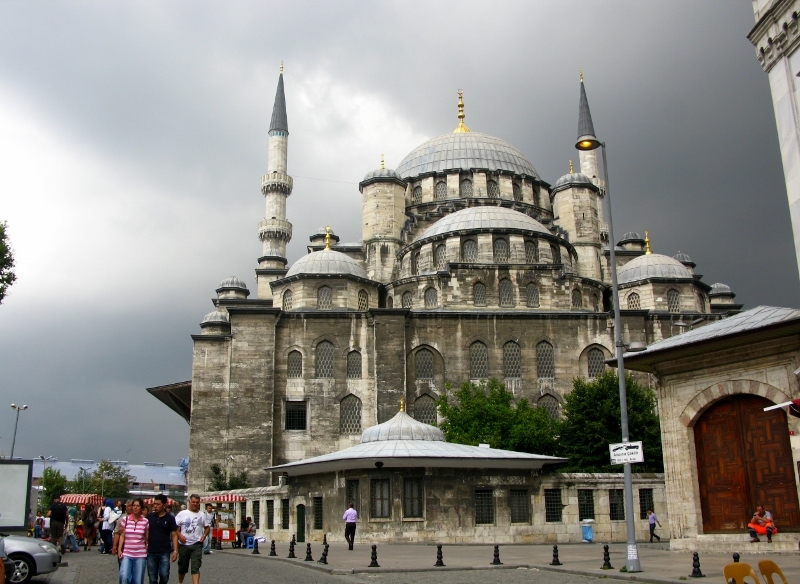 However, the architect misunderstood the request, and he instead built six (alti) minarets. Sure it could happen to anyone, right? But a little like how Carton House in Kildare had to shore up one of its windows so that it wouldn’t have more than Buckingham Palace (I swear I remember that fact from a school tour…), the Blue Mosque created a bit of a hullabaloo: The six minarets stirred concern among the people, as Mecca’s Harem Mosque also had the same number of minarets. To resolve the issue, the sultan sent his architect to Mecca to construct an additional minaret to the other mosque. There are about 200 windows and the chandeliers have ostrich eggs perched on them to discourage spiders from spinning cobwebs – a new one on me. It was completed in 1616 (not for the first time I marvelled at what we could do before we were modernised …) and holds about 10 000 people. On Fridays, the crowds are so big that they spill out in to the courtyard. At least some religions are still pulling in the numbers. My friend tried to pass herself off as a muslim and enter through the prayers (as in those who pray not those that are said) door; the visitors door was closed and she had every intention of praying and wasn’t carrying a camera, we figured it was fair enough. I’d already been and at this stage was getting just a tad peeved at the crowds. Anyway, she was spotted and turned away. This makes me wonder – what if she converted… what would she have to do or say to get in then? And is there a ‘look’? Do I look Christian? The mind boggles. If you’re interested in knowing more about this magnificent place, Tom Brosnahan has written a lovely piece on the Magic of the Blue Mosque. 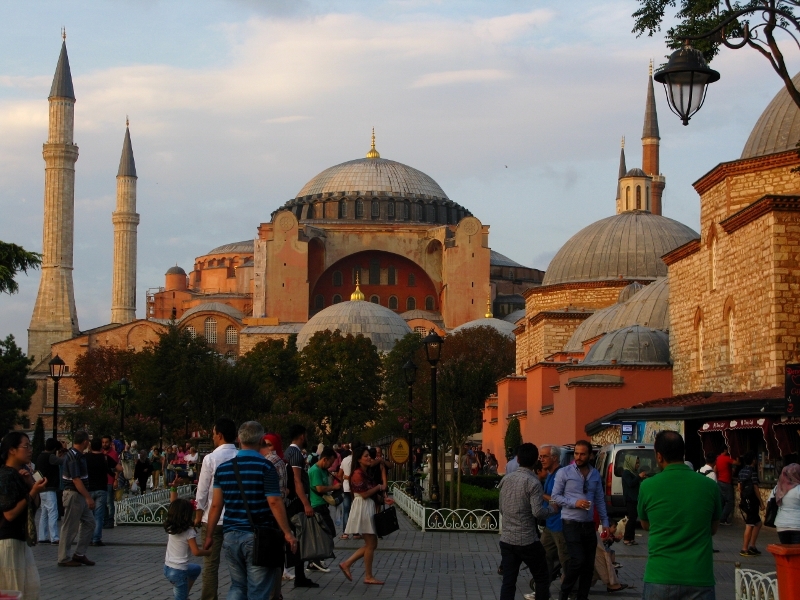 Across the way is the Hagia Sophia, or Shrine of the Holy God. It started off life as a cathedral in what was then known as Constantinople. When it was turned in to a mosque, the altar, bells, icons, and other trappings were removed. Today, it’s a museum. It is massive. So big, in fact, that until the Cathedral was built in Seville in 1520, it had reigned as the biggest church in the world for nearly a 1000 years. 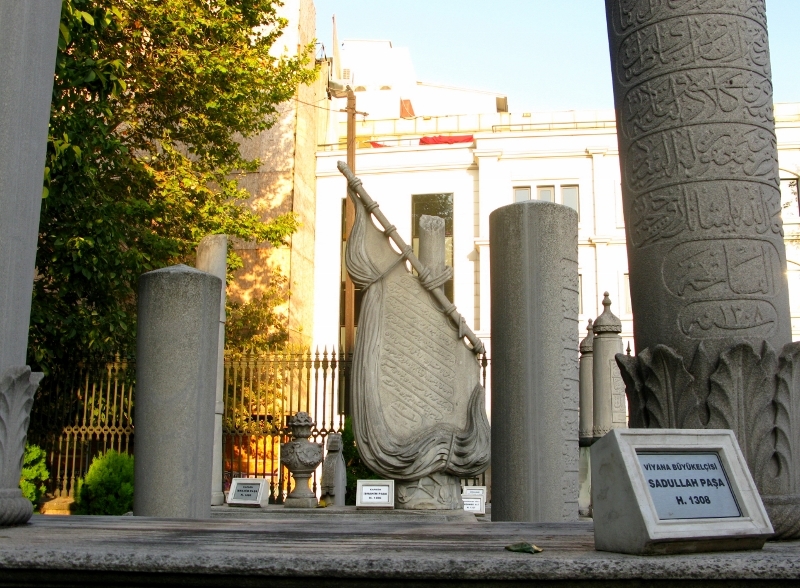 It finally closed its doors as a mosque in 1935 and reopened some years later as a museum. Elsewhere in the same vicinity, you can see the Ayasofya Turkish baths, where one lucky gentleman gets the place to himself:-) Built at the request of the Sultan’s wife in the 1500s, architect Mimar Sinan had this to say: I hope that until the end of days, good hearted friends who take a look at what I have made, when they will perceive the seriousness and the spirit of my effort, can have a fair view and can invoke my name to pray for me. I wonder how many of today’s budding architects design with the same thought in mind? Around the corner, at Tavukhane SokagI No:36, the Turkestan Asevi restaurant has a delightfully different frontage that brought to mind a movie set at Universal Studios. Had I checked Trip Advisor (which I never do until after the fact) we’d have skipped it. Am glad we didn’t. The place is charming, the service was grand, and apart from the fact that it’s a totally dry establishment (no booze!) it was worth a visit. I never made it inside the Hagia Sophia: next time I’ll visit, along with the old jail which is now the Four Seasons and the myriad other places I’ve discovered since I left. Perhaps I really should start reading up on places before I go, but then I think that might take away some of the joy of discovering what I come across by wandering aimlessly. Anyway, there’s plenty of time to go back and visit again. Istanbul isn’t going anywhere. But then I think of the wise woman’s warning: the biggest mistake you’ll make is to think you have time. And I think again. Way back, many moons ago, in my first year at university, I came across two guys I knew from third-year Engineering debating which word best described me: innocent or naïve. 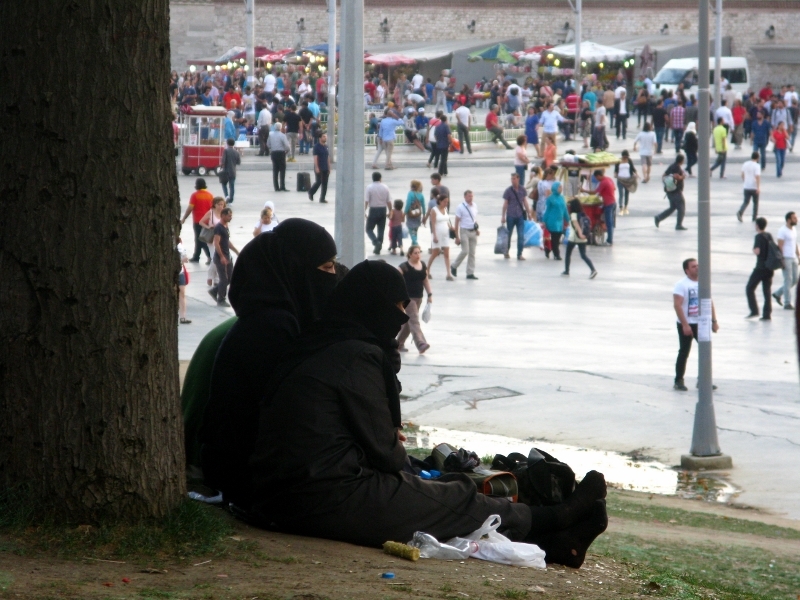 Although I can’t remember what they decided, I was reminded of that conversation this week in Istanbul. Referring to a blog post I’d written earlier in the week about indecent proposals and other first impressions, a Hungarian friend commented that we shouldn’t blame others for our own ignorance. 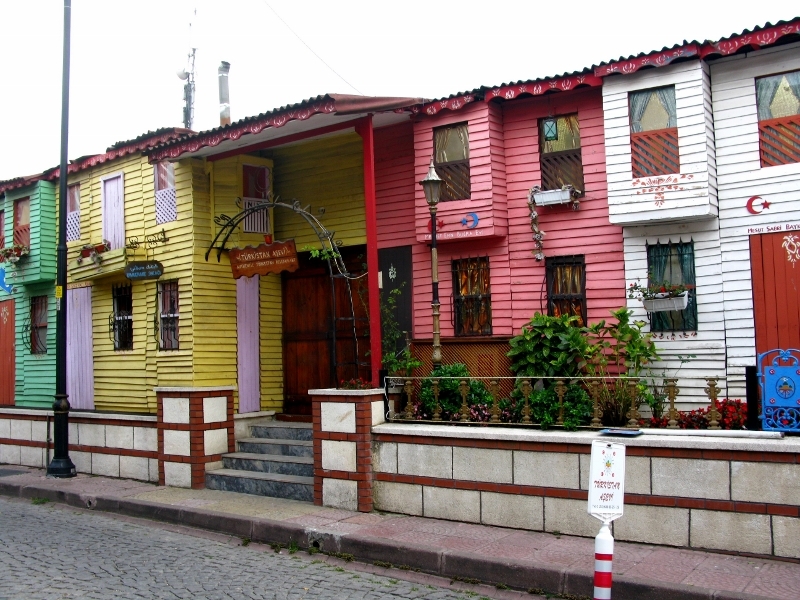 It took me a while to assimilate and on reflection, yes, what I had experienced was culture shock and my ignorance of Turkey and its ways of life certainly contributed. The lessons continued this week. Going back to the hotel one evening, we passed two shoeshines. One dropped a brush. I picked it up and ran after him to return it. He took it and smiled his thanks. I rejoined my colleagues. Then he came after us, offering to shine our shoes. I took it as a gesture of gratitude – those brushes cost money. My Romanian colleague was a little more sceptical; my Czech colleague was leaning that way, too, but wanted to believe. I was wrong. Shoes shined, they asked for payment. Seven lira each (about €2.50/$3.20). Not exorbitant by any means but it was the principle that was at stake. I was quite upset by it and said as much but eventually passed over what coins I had. Even still, I refused to believe that the chap had dropped his brush on purpose. 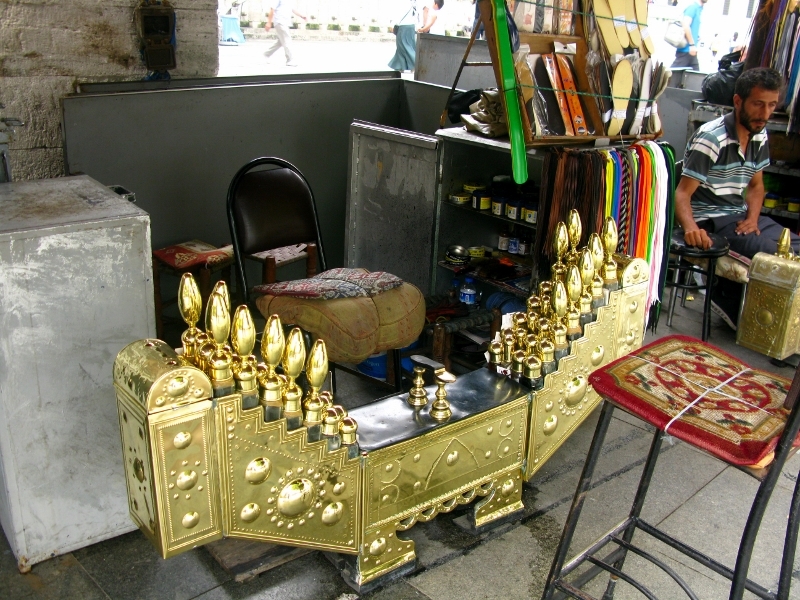 The following morning, on the way to the conference with a fourth colleague (Serbian), we passed a shoeshine in transit. I saw him deliberately throw down his brush. When my colleague went to pick it up, I stopped him. That evening, I passed a couple embroiled in an argument with the same chap. They, too, had been taken in. It is quite a clever scam and one that clearly plays to people’s humanity. The more I think about it, though, the more attached I get to my particular brand of innocence/naivety. 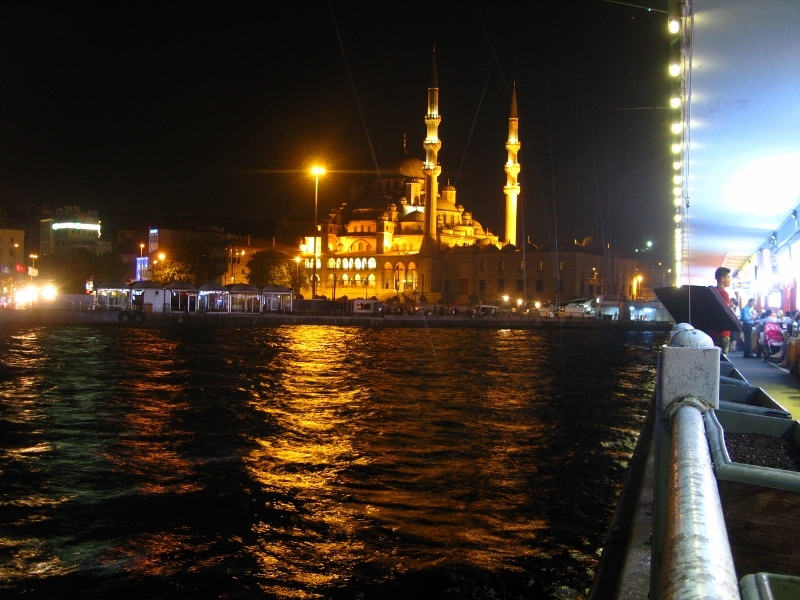 Were I to live in Istanbul for any length of time, I would be afraid that I’d lose it. I’d like to think that I would be able to keep laughing at the good of it all, but deep down, I’m sure my idealism would fade and I’d become cynical. While there’s room for cynicism in the world, that space might be better served, methinks, if complemented by an innate belief that people’s intentions are good. I’ve heard tell that Muslims are buried standing up. And the Muslim cemeteries I have been to would suggest the same. I did some digging and while there’s a wealth of information available on various websites and blogs, it is often contradictory. From what I can gather, as soon as you die, your eyes are closed, your jaw is bound, and you’re covered with a sheet. It’s a quick burial – before the next sunset or within 24 hours (and I thought the Irish were quick about it). The body should face Mecca – or the head at least – and some say that a copy of the Koran should be put under your head (not sure how this would happen though, if you’re standing up). Hidaad (mourning) for a family member lasts for just three days. No unwanton display of emotion is permitted as it might disturb the dead. Irish banshees and caoiners (professional wailers) would be out of business. Women who have been widowed though have an extended period of mourning – Iddah (or Edda) – which lasts 4 months and 10 days. During this time, the woman can’t wear perfume or jewelry, can’t remarry, and has to sleep at home each night, only leaving the house to go to work or run errands. Irish Catholic funerals are more for the living than for the dead. I’ve been to funerals of people I’ve never met, but I knew their sons, daughters, sisters, whatever. At a Muslim funeral, men face Mecca in the front row, then children line up in the second, and then the women. I’ve said before that if there’s a feminist streak in me, it wouldn’t cut butter on a hot day, but still this is something I think I would have difficulty with. The entire service takes place standing and a significant part of it is silent. There are lots of variations on the above, depending on what you read and where. What’s interesting for me though, is the standing part. I know my soul will leave my body when I die and that my body couldn’t care less what position it’s in, but enough Irish folklore has seeped into my blood for me to still balk at the idea of standing upright for eternity. For the most part, graves are above the ground and there’s a marked absence of flowers and candles. I wonder what Muslims in Hawaii do, given the locals’ penchant for decoration? 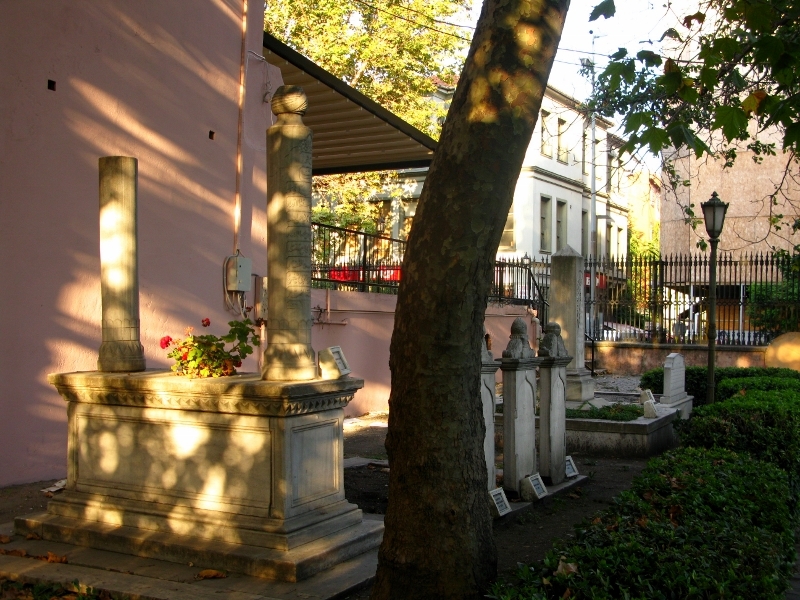 In the province of Istanbul, there are 333 cemeteries, apparently, of which 268 are Muslim. The one I happened across was rather small and as I couldn’t make head nor tail of the dates, I have no idea of its age. Even with the complete lack of adornments (and perhaps because of same) it was rather beautiful. I have no idea of the name either. 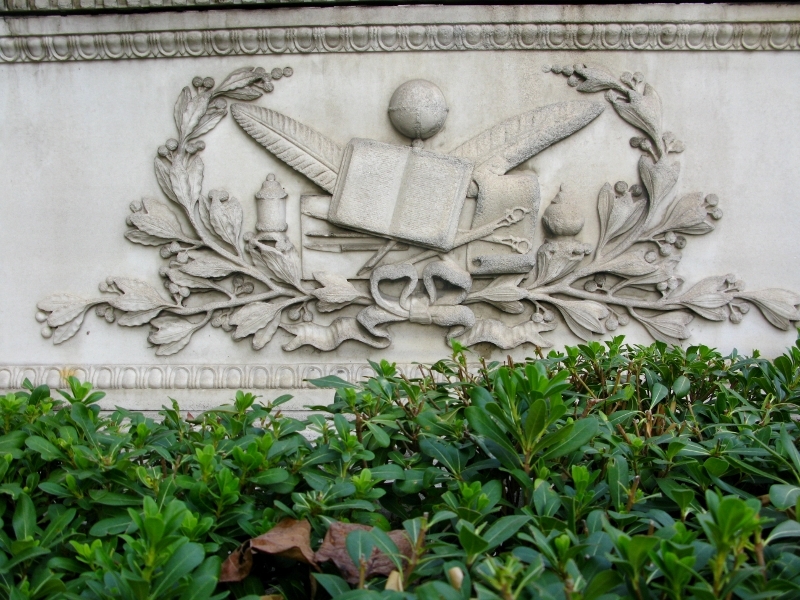 The sign on the wall outside said ‘Türk Ocağı İstanbul Şubesi’, which according to Google Translate means ‘Turkey, Istanbul Branch in January‘. But I’m sure it was a cemetery…. https://unpackingmybottomdrawer.com/wp-content/uploads/2017/06/logo-300x82.png 0 0 Mary Murphy https://unpackingmybottomdrawer.com/wp-content/uploads/2017/06/logo-300x82.png Mary Murphy2014-09-04 09:17:502018-05-02 11:02:27Eternal rest? I’ve a thing for markets. I can spend hours sifting through other people’s junk. 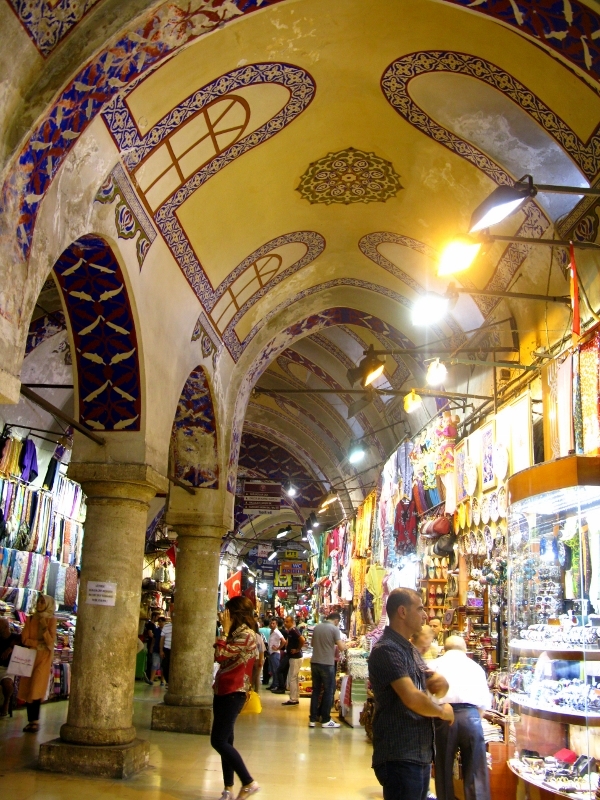 The Grand Bazaar in Istanbul was high on my list of places to see. What I hadn’t bargained for though, was the matryoshka effect. 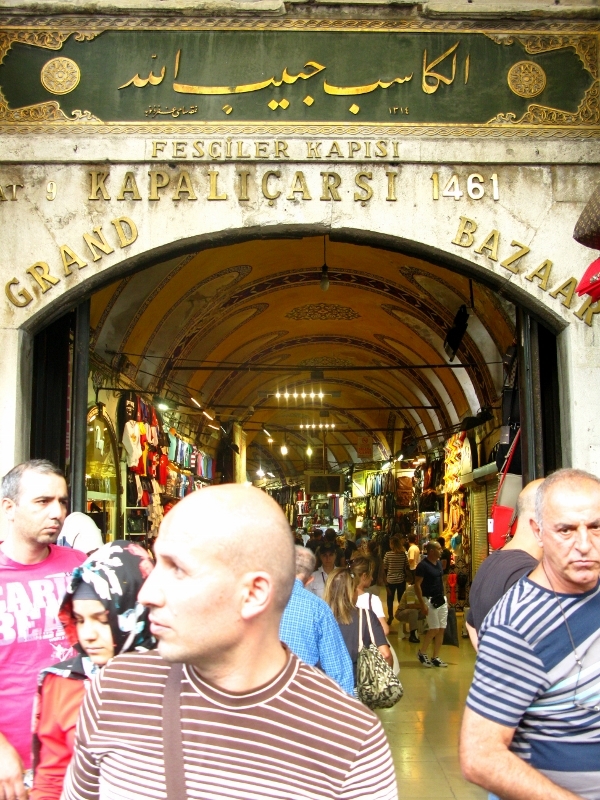 Just like the Russian nesting dolls, the Grand Bazaar opened on to other, much smaller, delights. I wandered in through Gate 7 and came out through Gate 14. I have no idea how many gates there are but it is, apparently, the biggest indoor market in the world. And it’s impressive, with its 56 interconnecting vaulted passages, housing over 4000 shops.There’s even a website advising you how to prepare for the experience (which, of course, I found after I’d been). It’s a warren of small boutiques and stalls selling everything imaginable and more. I had a few moments of blind panic when I lost my way and couldn’t remember from which direction I’d come, so that was a tad distracting. But for the most part, while the glitz was something to be seen, on my market meter it ranked a 6. It takes more than bare bums to impress me. 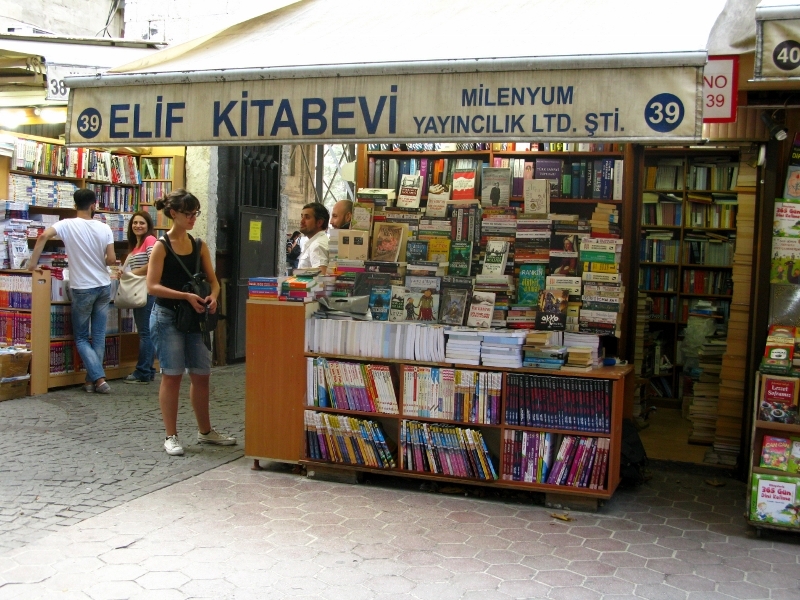 The joy came later, when wandering through the maze of streets surrounding the bazaar, I ventured through an archway, went around a corner, and came across the Sahaflar Çarşısı, a second-hand book bazaar. 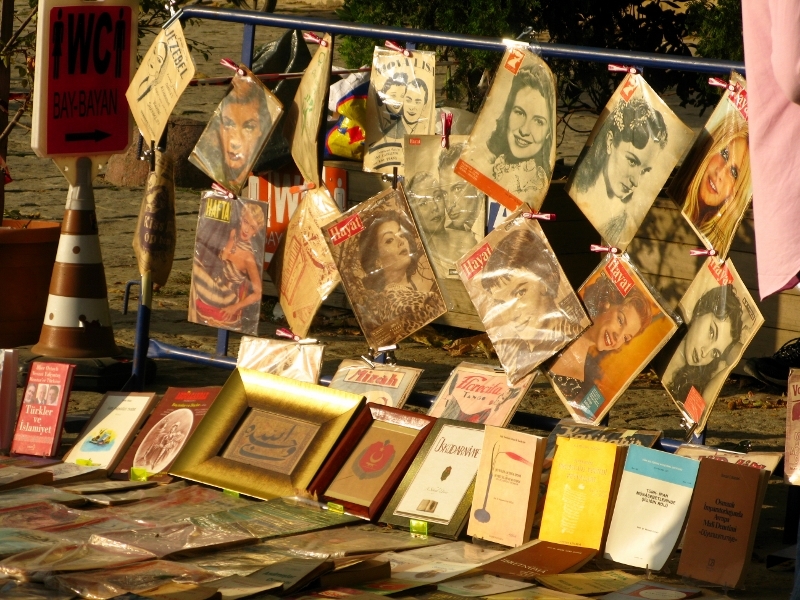 And then, through another archway, I found my Mecca – a flea market. Give me blankets on the ground over stalls and boutiques any day. What was interesting was that all the sellers were men. Not a woman in sight, other than those buying. In the calm light of a waning afternoon sun, these men just hung around chatting. Some deals were struck but for the most part, men on their hunkers passed the time of day, smoking and drinking coffee. Despite the cacophony of conversation, it was a tranquil place, a social place, one where I’d imagine y0u’d come in search of solutions to all sorts. Were I living locally, I’d be a regular.